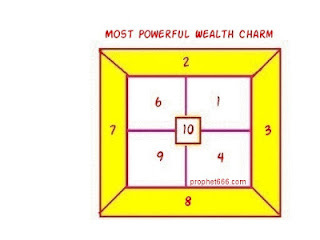 This is one of the most powerful of the Indian wealth and money charms which I have come across. The charm is called as the Laxmi Bisa Yantra dedicated to the Goddess Laxmi. This Yantra Sadhana is said to shower upon the worshiper all kinds of wealth, prosperity, riches, money and material and financial rewards. The Sadhana has to be commenced on a Tuesday by preparing the Yantra on a piece of paper with any kind of ink. This has to be done 5001 times; in a span of a few days. When you have finished making 5001 Yantras then they have to be collectively worshiped by doing a Panchopachara Puja. Panchopachara Puja.is a simple form of worship in which the object of worship is offered Gandha [vermillion or sandalwood paste], flowers, incense, Diya [oil lamp] and Prasad. This done the Yantras have then to be immersed on by one is a flowing water body like a river. Then on the day of any Solar or Lunar Eclipse or on the day of Laxmi Pujan during Diwali the Yantra has to be prepared on a Bhojpatra; written with Ashtagandha paste. This done the Yantra has to be stitched in a red colored piece of cloth and put in a Silver Locket and worn as a Charm around the neck. I know that this is a lengthy Sadhana; takes time and effort; but no reward without hard work. This depends on you how many Yantra you can prepare in a day; there is no fixed time limit. Thanks sir for the reply back.. I have some more queries to let know and hope you'll help in clearing them out. 1. Can you explain sir what we say GANDHA does it in hindi means 'tikka or sindoor'..
2. Where can we find ashtagandha paste..
3 You wrote "Yantra has to be stitched in a red colored piece of cloth" Stitched with didnot get this ? 4 last one the fingures 2,3,7,8 are in colour have to make it in colour or something like that kind or simply draw them on a paper as shown in the figure above..
thankyou will be anxiously waiting for your reply..
Gandha is a Tikka of Sindoor or Sandalwood paste. Ashtagandha paste and all the other items can be found in any shop selling religious items. The Yantra has to be put in a red cloth like a Tabeez and stitched from the outside and then put in a Silver locket. Draw the figures as shown in the diagram the color will be that of the Ashtagandha paste. Thanks a lot sir, that's so nice of you..
"Draw the figures as shown in the diagram the color will be that of the Ashtagandha paste".. I got the rest things explained by you leaving this one. "As I am preparing the figure on a paper with the blue ink".. I was wanting to confirm that the outer boundries in which numeric 2378 is witten should be couloured from the bottom. "means first we have to colour that area with colour as diagram shown in yellow colour and then numerics are written on them or we can straight way write leaving colour"
The 5001 Yantras are to be prepared with any ink including blue on white paper. The one to be worn on the body is to be written with Ashtagandha paste on Bhojpatra as explained in the last paragraph. Colors are given for demonstration purposes only there is no need to add any colors. The Puja to be done during the day or night ? If during the day, the visarjan of the yantra to be done on the same day or on the next day ? Can Flowing water be a ocean or it has to be a river or a lake ? Respected sir I am anxiously waiting for your revert back, and I have been to religious shop and asked about ashtagandha paste but he said never heard about that in return he was offering me the powder shall I have that if yes how to make paste from that and with what it should be written on bhojpatra, with finger or something else. Please do revert sir as said by you have to make it done on diwali. Namaste guruji, I am having ashtagandha powder, can I use it for writting by converting it into paste by using some water ? Is it convinient ! And if yes what should I use to write it with..
All details are given in the post , what is unnecessary is not given. Mustard Oil and any stick for writing can be used, Ashtagandha powder is mixed in water to make a paste. There is no particular day for immersing Yantras in water. respected sir as given here that the sadhna has to be commenced on a tuesday ,i want to ask you that this time diwali is falling on a tuesday can i begin and complete my sadhna on the same day of diwali ???? i would request you to answer me quickly as there is no time left for diwali ???? Repected sir, first of all wishing you a very happy diwali.. Sir due to some reason was not able to make the yantra yesterday I.e on diwali, now what have to wait for the eclipse.. And want to know have to wear the locket regular or can remove during night while going to sleep..
i wanna ask u tht cn i make 6 yantra on 1 page f a register so tht wen i complete 5001 yantras thn it will b easy to worship a register in which i made 5001 yantra. or it is necessary tht i seperately made 5001 yantras on 5001 pages. Jaimatadi, can we make it on a computer and then worship it as written or we need to make hand written yantras only? Sir, if you don't mind, or if my question is answerable can i please ask you if the yantra can be drawn on my computer, and get 5001 copies or get small yantras of the above shown on A4 paper, cut one by one to make 5001 and do the procedures mentioned.. was only wondering as you mentioned any kind of ink and white paper is the basic of this yantra..
And the last yantra be hand-drawn on bhoj patra.. Thanks Sir and hope it wasn't stupid, my question..
Don't waste 5001 papers, prepare as many on a single piece itself but if it can be done on a computer or not, is something we need to ask Neel. or astagandha is diffrent from ashvgandha??????????? Ashtaganda is different from Ashwagandha; Ashtagandha is a powder like Sindoor, available in shops dealing in religious items. Sir, can we make 5001 yantras on a computer and tame printouts? No the Yantras have to be written and prepared by the person who is doing the Sadhana. Do they have to be symmetrical or they can be drawn with a free hand? Can be drawn with a free hand as shown in the drawing. You can use white paper instead and draw the Yantra with Ashtagandha paste; using a pointed wooden stick. I have few question so pls reply back at the earliest. 01. How long we need to wear the locket ? 02. Can we wear it as an amulet ? 03. Can we wear it with a gold chain in the neck ? 04. What do we have to do with the prasad ? Can we eat or we have to immersed in the running water ? The charm can be worn as long as one wishes; it can also be worn as an amulet with a gold chain. The Prasad is to be eaten and not immersed in water. Thanks sir for the prompt reply. can i also offer mithai in stead of prasad? Namaste Guruji. . Can I make 5001 yantras on register paper. .
Can we use 5001 computer print yantras, sir? Computer printed Yantras will not do, they have to be made as mentioned in the article. Diwali, Solar and Lunar Eclipse are the recommended days on which the final Yantra should be prepared. If unable to do so on these specific day then you could make it on any other auspicious Tithi, Shubh Muhurat or Hindu festival. I have started and made quite a few yantras and had to take break due to periods of my wife can I continue from where I left or should I start all over again ? Yes, you can continue the making of the Yantras from where you discontinued due to the Monthly periods of your wife. I want to thank you for your faith and time. My question is does one need to prepare these charms on these particular days or our faith alone work? Thank you. Do we need to chant any Katha when we draw this Charm? I mean to say that I have seen Thailand and Cambodian Monks / Masters always chant some Kathas during writing / drawing any Charms to make them SACRED and POWERFUL. + So, I wonder if we have any similar Katha when drawing this Charm dedicated to Laxmi Goddess or not ? That is not needed as it has not been prescribed for this Lakshmi Bisa Yantra Prayog.